Planning a corporate banquet can be fun as you begin to brainstorm ideas related to themes and entertainment. While these important details might be fun to plan at first, it is easy to feel overwhelmed as more and more decisions must be made within the prescribed budget. At the New Psalmist Retreat and Meeting Center (NPRMC), we are happy to do everything we can to ensure that your event goes off without a hitch. Our facility boasts several banquet halls that are sure to meet your needs, and we’d love to give you a tour. Call us at 1-888-239-6272 today to request a proposal online! 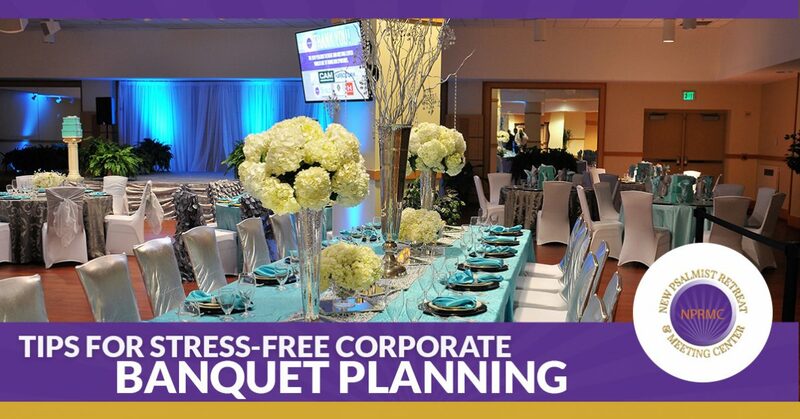 Planning a corporate banquet can seem overwhelming. With a bit of helpful advice, the task can be made easier, and in today’s post, we’ll review a few tips that can help you in your planning. Read on to learn more! Before you commit to any vendors, it is important to know what you can afford. Be sure to itemize any anticipated expenses, including those related to food, entertainment, the event venue, speakers, and decorations. Having everything itemized before you hire any vendors will help you track your spending and avoid unexpected expenses. Even the most detailed and carefully planned budgets have the tendency to overlook expenses, and if you find that it is getting difficult to maintain your original budget, it can help to seek out sponsors. Close business partners and affiliates may be eager to help you financially if they are allowed to promote their business at your event, and that can help reduce your bottom line. When planning for guests and entertainment, it is best to plan ahead. If you plan on having a special guest or speaker at your event, it is important to book them as soon as possible. Booking guests and other entertainment early will help you get the best rate as fees tend to climb the closer you get to your event date. There is nothing more frustrating than having every detail in place and having something or someone fall through. It is important to remain flexible as you plan the event. When you book your event venue or keynote speaker, be sure to have a backup banquet hall and another form of entertainment just in case. No matter how big or small your event is, it is important to consider the safety and comfort of your guests. If it occurs during a typical meal time, your guests may expect to be fed during the course of your event. Weather in Baltimore can be unpredictable, and valet parking can prevent your guests from being exposed to the elements while arriving or leaving your banquet. 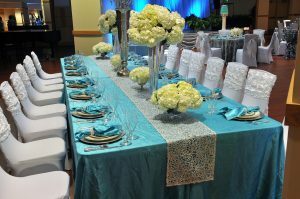 Are you searching for an affordable banquet hall in Baltimore for your next corporate function? Look no further than NPRMC! Our facility offers a wide array of rooms for you to choose from, and we offer catering, security, and valet parking for your convenience. Call us today to learn more!